Dr. Rassouli and the Center for Oral Health are now offering limited-time complimentary consultations for dental treatments, including restorative, cosmetic, implants, and other services. Dr. Anthony Rassouli, dentist in Orange County, and his team at the Center for Oral Health are now offering complimentary consultations for dental treatments for a limited time. The Center for Oral Health is a full-service dental office that features general dentistry, restorative dentistry, cosmetic dentistry, implant dentistry, Invisalign, periodontics, same-day dentistry, and dental surgery. Patients can take advantage of this offer and learn more about their smile options. Patients can get crowns placed in a single appointment with same-day crowns. These crowns use high-quality dental porcelain and the most advanced dental technology for a restoration that looks and feels like a natural tooth, while eliminating the need for a second dental visit and the inconvenience of a temporary crown. Zoom teeth whitening is one of the fastest, most effective ways to whiten teeth. In just one hour, patients can lighten their teeth eight to ten shades and eliminate stains from tobacco, wine, coffee, tea, soda, and other common substances. veneers One of the most effective ways to conceal many flaws at once, porcelain veneers are placed over the front surfaces of teeth. Their translucent surface looks just like dental enamel but offers a flawless finish for patients with chips, gaps, discolorations, and other aesthetic problems. Invisalign is an orthodontic solution for patients with crooked, gapped, crowded, or misaligned teeth. Invisalign aligners allow patients to straighten their teeth without the discomfort or unwanted appearance of braces. A lost tooth can cause serious problems for a person’s dental and overall health. Implants offer the most natural replacement option possible. Dr. Rassouli provides patients with personalized treatment plans. Sleep apnea treatments, TMJ treatment, and night guards for bruxism are all available. Patients can also take advantage of a variety of dental sedation options, including nitrous oxide, and IV sedation, depending on their needs and the extent of their anxiety or dental health needs. 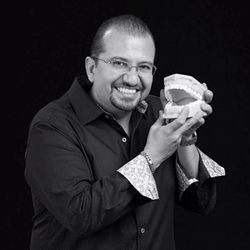 Dr. Rassouli is the co-founder of the South Coast Dental Academy, an organization that offers Orange County-area dentists the ongoing instruction they need to remain abreast of the latest advances. Dr. Rassouli is a graduate of the University of Southern California. During his time there, he served on the Accreditation Committee. After graduation, he served on USC’s Century Club’s Board of Directors.